One subprime mortgage collapse and one environmental mega-disaster should have taught the SEC and the EPA that companies motivated exclusively by the desire to maximize profits can’t be relied on to act in the interests of consumers. Congress and the FCC should learn this lesson, too. They have a big role to play in broadband. During the last 10 years the U.S. government has taken a deregulatory, hands-off approach to the telecommunications companies that provide broadband. Large broadband carriers have been allowed to (re)consolidate into huge conglomerates, but they’ve failed to keep their promises to expand into each others' territories, increasing increase competition. They have also been allowed to stop sharing their broadband infrastructure with smaller regional carriers that would use it to provide competitive broadband and voice services. The result of this hands-off approach is not pretty. The Organization for Economic Co-operation and Development (OECD) says the United States ranks 15th (as of December. 2009) among industrialized nations in broadband penetration. Broadband providers argue—to some extent correctly--that comparing the United States to countries with very different sizes and populations has limited utility. Still, the idea that only 27 out of every 100 people in the U.S. have broadband is disconcerting. And the reason people choose not to buy broadband is price: The FCC report accompanying the National Broadband Plan says that the main reason Americans don’t buy broadband service is that they can’t afford it. 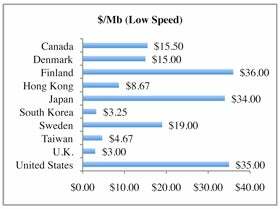 The New America Foundation recently looked at how much U.S. consumers pay for 1 megabit per second (1000 kilobytes) of speed relative to consumers in other parts of the world. It found that U.S. consumers who buy low-speed plans (1 mbps to 10 mbps) pay an average price of $35 per mbps per month. 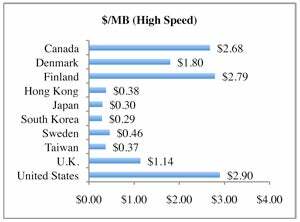 In the other nine countries studied, consumers pay an average of $20 per mbps per month for low-speed service. For high-speed plans (50 mbps to 200 mbps) like Verizon’s 100 mbps for $150 per month plan, U.S. consumers pay an average $2.90 per mbps per month. In most of the other industrialized countries studied, broadband was available for less than half what US consumers pay--$1.13 per megabit per month, on average. Why are broadband prices high? Because there simply isn’t enough competition in most broadband markets. The FCC report says that 96 percent of Americans have two or fewer options for broadband providers where they live. And 78 percent of Americans live in areas where just two companies--typically a phone company and a cable company--offer broadband service. The report also indicates that in areas where competition among broadband providers is weak or nonexistent, Internet access tends to be more expensive. Economists will tell you that in the age of “too big to fail” the regulatory gestalt is to create markets where smaller, more nimble players compete for smaller slices of the business. While tougher FCC oversight is the likely result of the National Broadband Plan and the eventual re-tooling of the Telecommunications Act of 1996, will this be enough to create true competition in broadband markets? I doubt it. Maybe a bold stroke is needed to create the fundamental change that's needed. One such bold stroke would be a “public option” for broadband. The “public option” proposals in the healthcare bills were designed to create a new, low-cost player in the health insurance market. This, the thinking went, would apply competitive pressure to the large insurers, which dominate the market, and would eventually increase the quality and lower the costs of healthcare. The same approach might create those positive effects in the consumer broadband market. The government would provide a reasonably priced basic broadband service that’s available to all consumers. The broadband service would be administered nationally by an FCC-led program, and the service itself would be allowed by law to run over existing broadband infrastructure owned by cable and/or telecom companies. Such a program could also be run at the state or municipal level, so the people running the plan would be closer to the broadband network and to the customers it serves. In a slightly less "socialist" approach, broadband service could be administered by the large ISPs themselves, according to a strict set of service guidelines that the FCC would create and enforce. The broadband service itself would be basic. Since the FCC has set a goal for broadband service to be universally available at 4 mbps downstream and 1 mbps upstream by 2020, so why not set the bar there for the minimum speed requirement of the public plan? If people or small businesses wanted faster or fuller-featured broadband service, they could easily pay extra for higher tiers of service from the private ISP of their choice. But the public option would always be there as a safety net. This, of course, would be a massive undertaking on the scale of, say, Medicare. But given the growing importance of broadband access for all, shouldn't it be considered?